Travelling to and within Perú is getting easier and easier. We took a direct flight from Gatwick to Lima and then a short flight up to Jaén in Cajamarca. 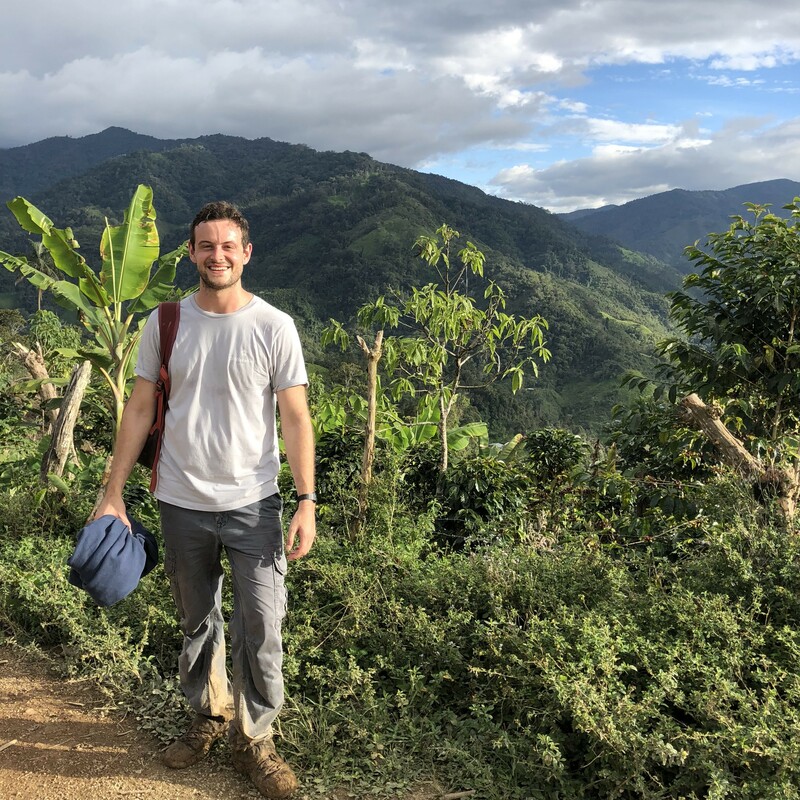 Jaén has changed greatly over the last 5 years and some consider it to be the coffee capital of not just northern Perú, but of the entire country. Nowadays everywhere you walk you can see the offices of a cooperative. Coffee is everywhere in Jaén, it’s even drying on street pavements. But why were we there? 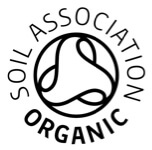 To see our main partner in Perú: Sol & Café. We were the first international buyer of their coffee and it’s been a real pleasure to see them flourish and grow. Every time we visit there is something new afoot and this visit was no exception. 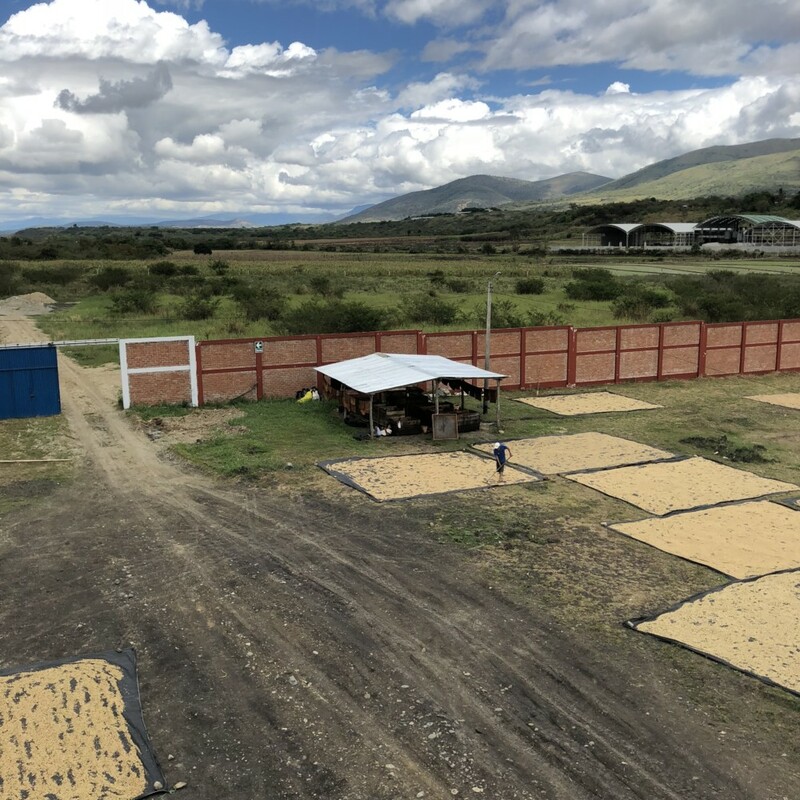 They have extended their drying enclosure situated near Jaen airport and built accommodation for producers to stay in when they are drying the coffee. They have built a nursery which they will use to study what varieties are productive, rust resistant and produce a good cup. They have also bought a new warehouse in Jaén where they receive and store parchment. In it they have an expanded lab and a health post for producers – when they hand in their coffee they can get a health check up! This did not happen by chance. In key positions such as general manager, head of sales, financial director and head of logistics, they have had the same people for 10+ years in some instances. You cannot help but notice this when you walk around. It’s like one big family. We didn’t just stay in Jaén however. We visited a few farms in La Coipa and Buenos Aires. Every farm we visited had a tremendous amount of biodiversity with so many types of native tree I gave up writing the names down. We saw a few familiar faces from Project 121 and it was interesting to see the cooperative using the same organic processes that I observed in Honduras back in March. Actually, this is no coincidence. 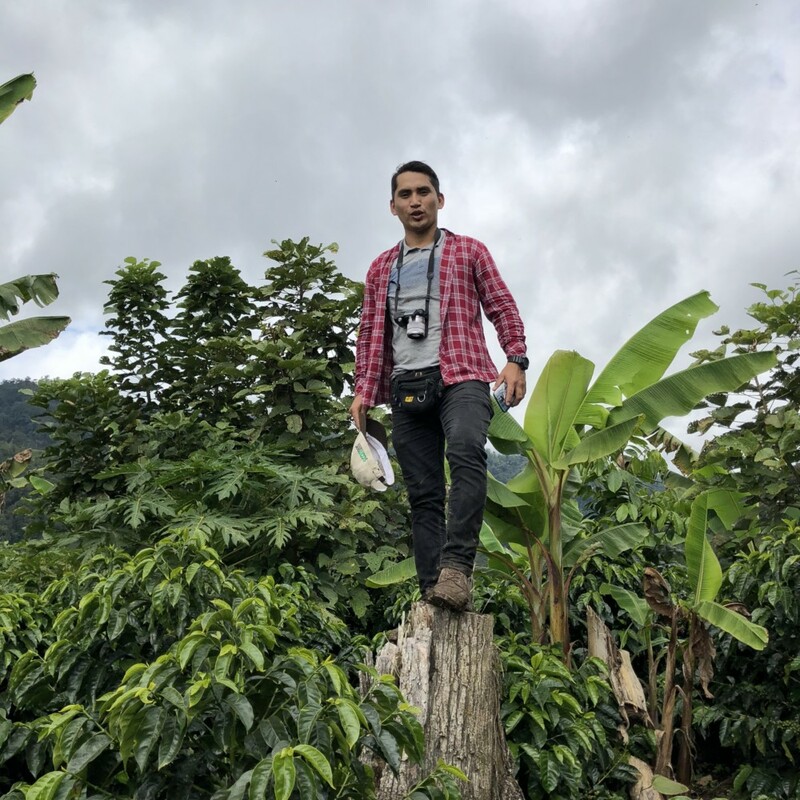 A cooperative from Honduras went to Sol & Café to share knowledge on microorganisms from the mountain and how to harness their power to accelerate the process of creating organic compost and fertiliser. I spoke with Ernesto, one of the agronomists at Sol & Café, and he said these organisms speed up the decomposition process as much as four times! All the producers of Sol & Cafe will be doing this next year due to the success of the pilot plots. In the lower altitude areas the harvest came early and for that reason it was expected to be a big crop. 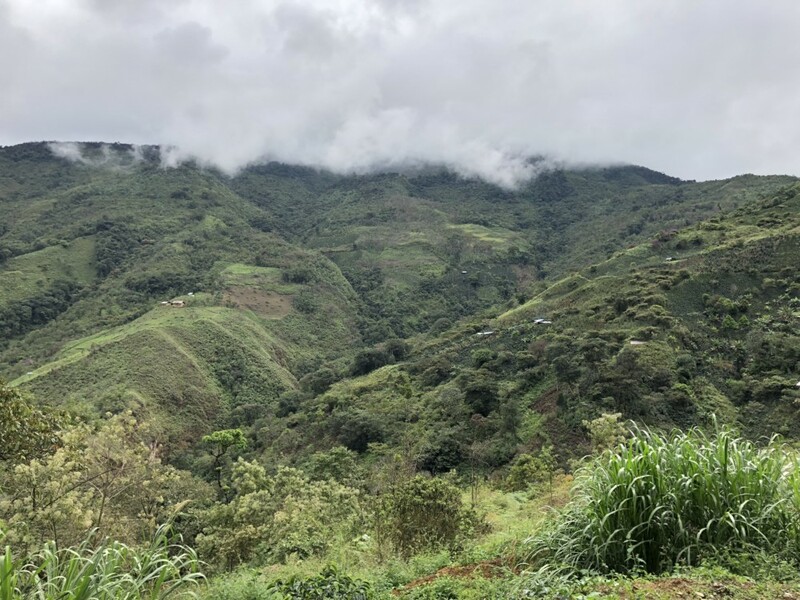 However, harvesting in higher altitude areas has been delayed due to irregular rains and therefore the cooperative has adjusted their forecasts to be the same as last year or slightly less. The following day it was time to leave Jaén. Due to heavy rain and misty conditions it took us a little longer than expected to arrive at Rodriguez de Mendoza (RDM) in Amazonas. In the end it took us 9 hours with a short stop in Chachapoyas. Amazonas is a long and thin region and Rodriguez de Mendoza is in its south eastern corner. It’s famed for having great coffee and due to the quality of the beans produced there the cooperatives can get a better price for their coffee than those from other regions. We source from two cooperatives there: Aprysa & Aprocurma. Both are small cooperatives compared to Sol & Café. The cup profile of both groups is complex and full of exotic fruits. They train their producers to pick the fruit when it’s a deep red verging on purple and they think this helps them achieve such a fruit forward cup profile. We visited some members of Aprysa that surrounded RDM and then went on to Nuevo Chirimito to see Aprocurma and a few of their members. 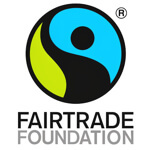 Both were formed in the last five years and like many cooperatives in Perú, their success has been built on the basis of having both Fairtrade and Organic certified coffee. Perunor, the exporter who we work with when sourcing from these groups, has helped them develop the cup profiles we look for and enjoy. We drove from RDM and overnighted in Bagua. We set off the following morning to visit Finca Los Santos, in Lonya Grande. 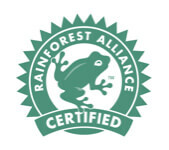 It’s still in the Amazonas but is the opposite end to RDM. José Santos, the producer, has 36 hectares of land, seven of which are geisha! 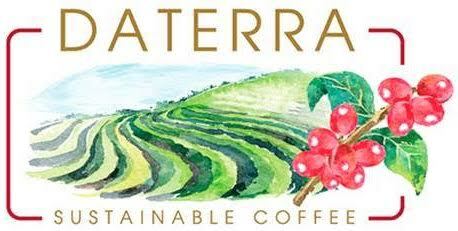 It’s an organic single estate that produces a balanced cup profile that’s typical of the region. We bought his coffee for the first time last year and it was a pleasure to visit José in person. This crop he intends to separate his Caturras and Geishas and process them individually to make microlots. 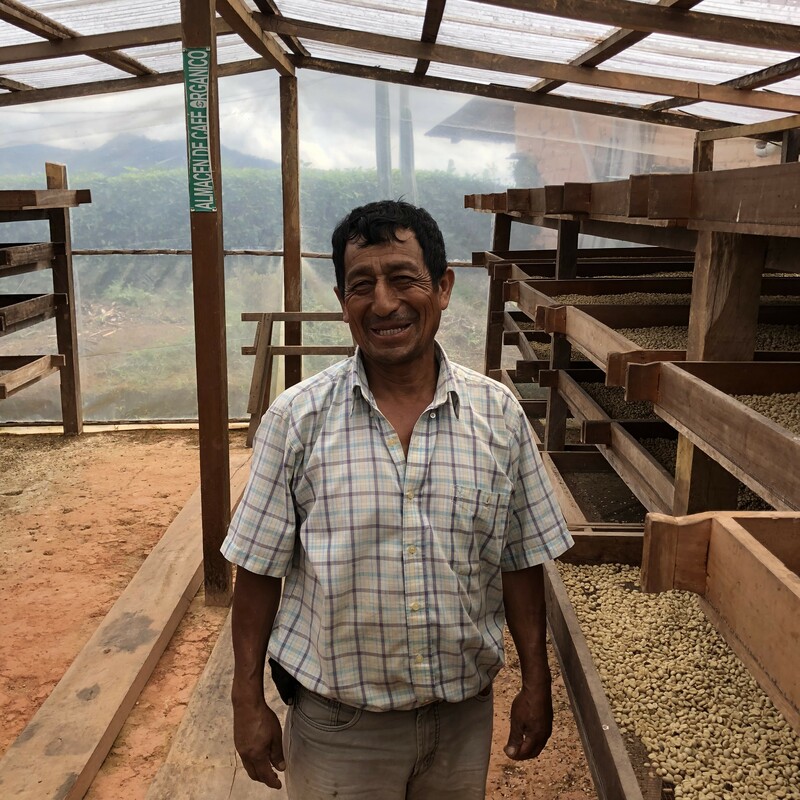 He is building a small lab on his farm so he can improve his quality control, as at the moment all his coffee gets cupped at the Aprocurma collection centre further down the mountain in Lonya Grande town. After our trip to Los Santos, we went to Chamaya to visit the Coinca mill where the cooperative’s coffee is processed and prepared for export. Again it was time to travel and after a short stop in Jaén, we met up with Cooperativa Agraria Frontera San Ignacio and drove to San Ignacio which is where we stayed overnight. We spent the day visiting some producers in the El Santuario Committee. 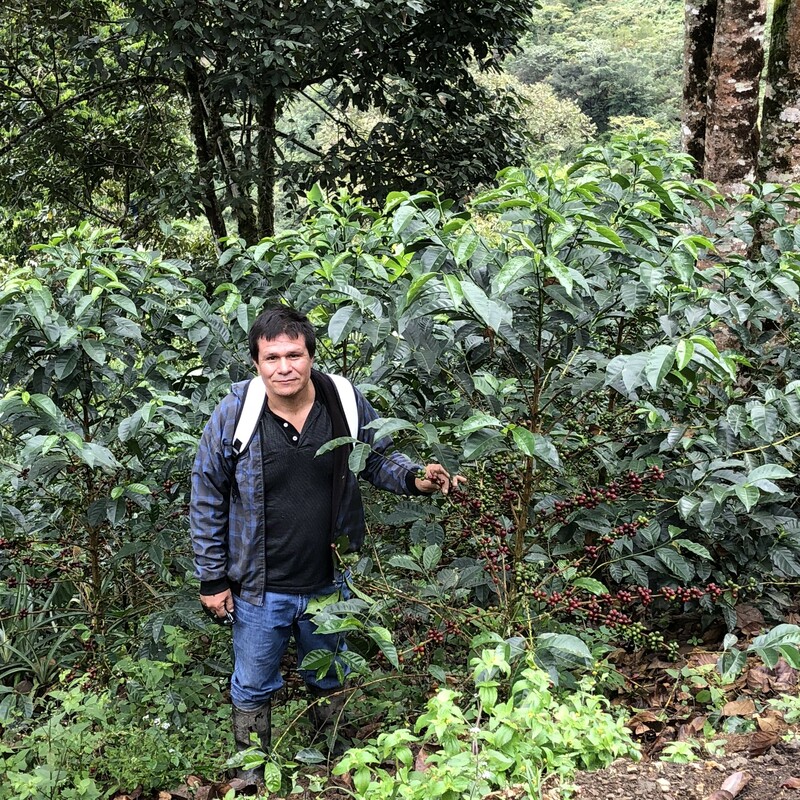 There are 16 committees in the cooperative and this one is one of the highest altitude committees, regularly contributing to the microlots Frontera produces. We have developed a Microlot called ‘El Oso’ with the cooperative’s cupping team and some of the producers we visited will likely be contributing to the El Oso coffee we will be sourcing later this year. Some of the fincas (farms) we visited were the steepest I have yet to see and we were rewarded with a lunch that was about three times the size of a normal portion! Much of the forest that surrounds San Ignacio is protected due to the variety of animals that reside there. I was struck by the diversity of shade trees and the quantity of organic matter on the soil. The technical team have done a great job working with the members of the Santuario committee. Many of the producers use the native tree ‘Romerillo’ as the material for the tanks where they ferment their coffee. 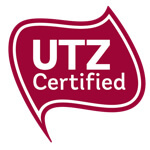 They have done experiments and the cup profile is superior when you ferment in these tanks as opposed to cement tanks or tanks made of other materials. The Romerillo tree is protected so they can only use trees that have fallen naturally of old age. After a quick visit to the office and warehouse in San Ignacio town, we drove to Jaén, where we took a sleeper to Chiclayo. 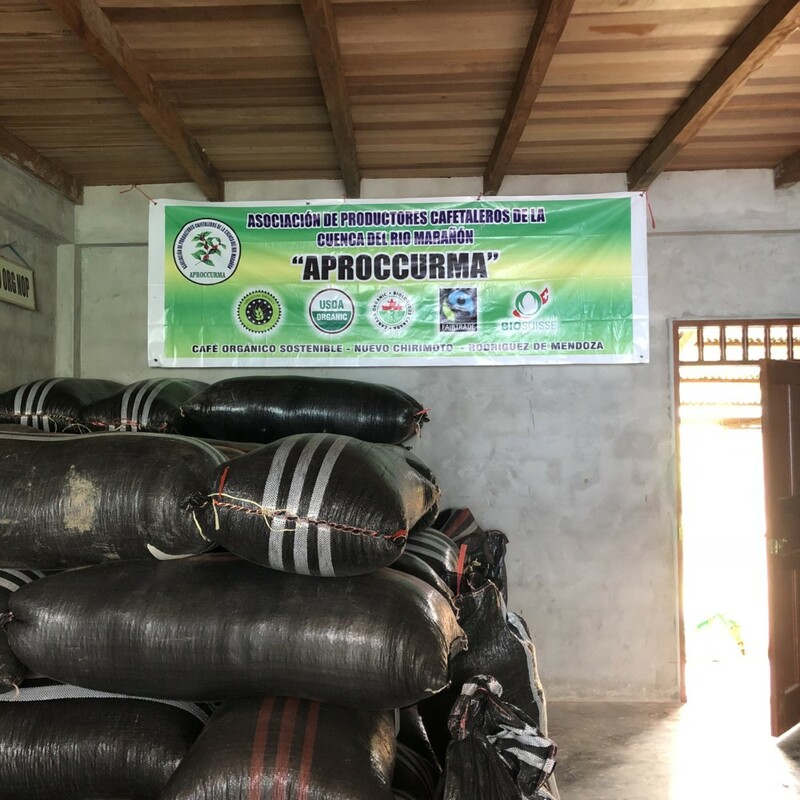 After seeing the fincas and the delivery of parchment to the cooperative’s office in San Ignacio, it was time to visit their dry mill and cup some coffees. Frontera owns the mill at Chiclayo and processes all their coffee there. It’s a big mill so they process coffee for other cooperatives and work with around 20 groups in the Cajamarca, Amazonas and San Martin regions. Having ownership of the mill means they get priority and this shows with the efficiency of their shipping! We cupped two tables and it was great to meet the cupping team and talk further about the kind of profiles we look for. After a great deal of discussion and coffees cupped, we homed in on the flavours and levels of sweetness, acidity and body we like. After a big lunch and a stroll on the beachfront, it was time to say goodbye. The next morning we were due to visit Corral de Piedra, a community in the Café Femenino Programme. 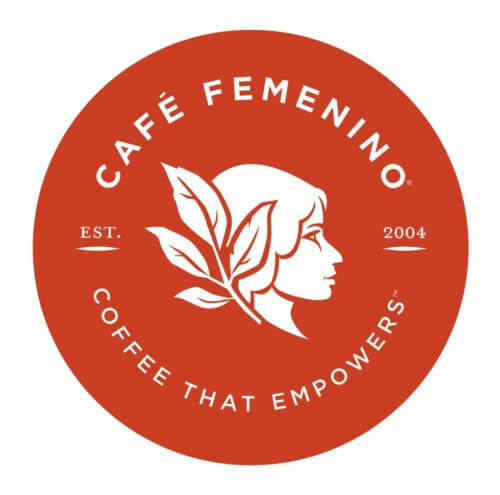 We picked some coffee with members of the community and went to the unveiling of a new centralised wet mill that was funded through the Café Femenino programme. 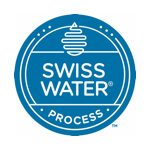 One of the big advantages the mill brings is a consistent supply of water. They worked with a local engineer to tap into the water source at the top of the mountain and bring it down to the mill. During the harvest, the area experiences from an extremely dry climate so this will ensure a big step up in quality for the community as they will have continual access to water. We shared a locally grown and traditional lunch prepared by the community and it was a fitting end to the visit. 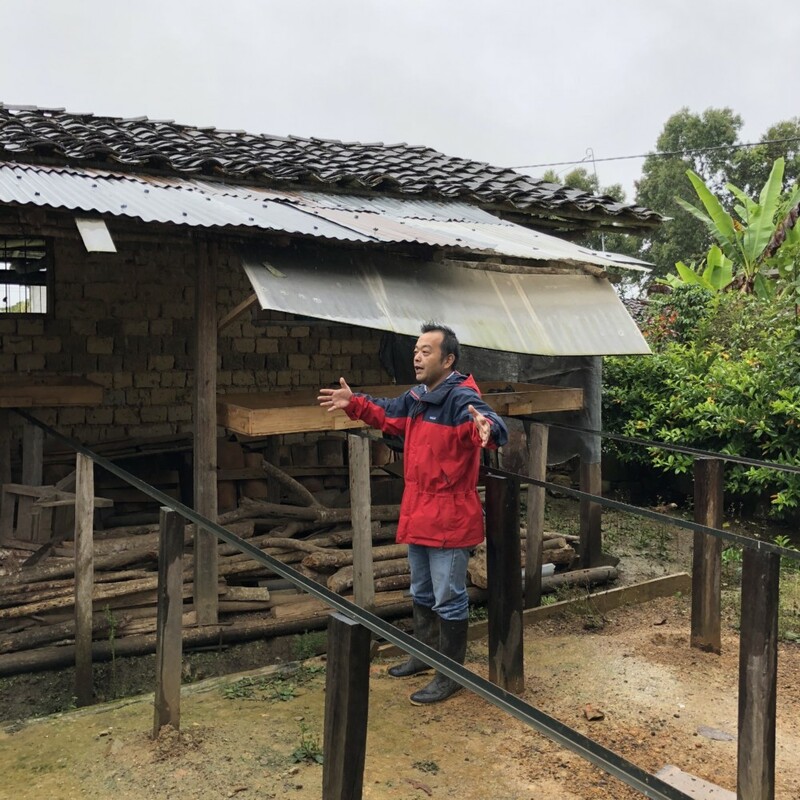 The next morning we cupped coffee from various Cecanor cooperative communities at their cupping lab in Chiclayo and were impressed with communities in Amazonas and Lambayeque. Again, we were struck by the family atmosphere of Cecanor cooperative. Two of the three cuppers there are brothers and have been there for decades! Their stories of how coffee has developed in Peru were fascinating to listen to. Overall, the quality of the Peruvian crop seems to be high thus far. However, the volume will be lucky to reach last year’s figure. It was a great trip, spending time with old friends and making new ones. Thank you to all the groups we visited for your warmth, kindness and hospitality – we look forward to the next time! Get in touch with a trader to discuss what’s landing soon! 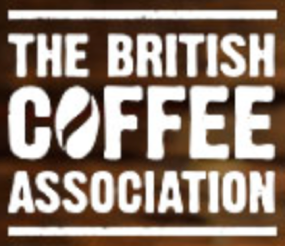 We have a variety of flavour profiles hitting UK shores over the coming weeks from Cajamarca, Amazonas and San Martin.